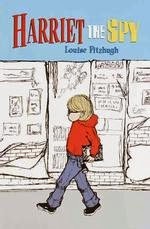 Harriet the Spy by Louise FitzhughHarriet M. Welsh, the 11-year-old protagonist of Harriet the Spy, carries her notebook everywhere she goes. She writes down her daily thoughts, as well as anything she finds out about her classmates, neighbours and friends through her spying activities; and her writing is honest if not always generous. Over the course of the novel, Harriet has to face two life-changing events: first her nurse, Ole Golly, leaves her position to get married, and Harriet feels her absence acutely. Secondly, one day Harriet’s treasured notebook falls into the hands of her classmates, and as a result she becomes a social outcast. The notebook includes passages about her two best friends, Sport and Janie, and Harriet doesn’t know how to bridge the riff this causes in their friendship — especially because her need to write is too big a part of who she is for her to be able to give it up. This was my first time reading Harriet the Spy, and both the tone and the details of the plot were completely different from what I was expecting. I knew the novel covered Harriet’s daily spy route and associated activities, and the plot summaries I’d read beforehand mentioned the discovery of the notebook by Harriet’s classmates. But I didn’t expect this to only happen in the second half of the novel. It’s interesting how everything that happens in the first half is so crucial to understanding Harriet’s isolation later on, yet neither the back cover blurb nor most summaries I found mention it. There’s plenty to sink one’s teeth into here, and probably as many angles one could approach Harriet the Spy from as there are readers, but what interested me the most was how I couldn’t help but spot some parallels between the events of the plot and attitudes towards women’s writing that persist to this day. 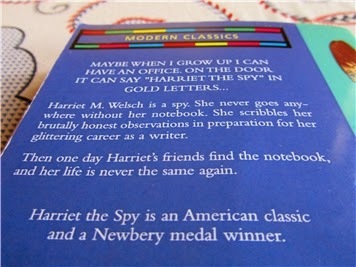 It can be argued that Harriet is drawn to spying for the same reasons she’s drawn to writing: because she’s interested in people. Her notebook entries are often less than tactful, but behind them there’s a genuine desire to understand what makes people tick. Part of this has to do with being a child trying to make sense of the behaviour and the emotional lives of the adults around her, but holding on to that curiosity as you grow up just might be the mark of a great writer (hopefully via perceptiveness and imaginative leaps, rather than, you know, actually hiding in people’s homes). “You girls need a few graces, you know, turning into young women any day now, don’t want to be clumps on the dance floor, nothing more embarrassing than a wallflower. Your mother’s worried about the way you move, Harriet.” And she suddenly focused on Harriet, waking her out of a reverie. To be clear, it’s the imposition, not the dancing lessons Janie’s mother wants the girls to attend in themselves, that constitute the problem — it always bears repeating that there’s no wrong way of being a girl. Harriet wants to move fast and not worry about grace or the lack thereof; she wants to be a writer and spy and at this particular point in her life she’s not particularly concerned with whether her writing hurts other people’s feelings. I love how the story opens up these possibilities for girls. I also find the extent of Harriet’s unkindness worth thinking about. Harriet’s private writings weren’t tactful, but Fitzhugh makes it clear that she only begins to act cruelly after her writing is taken away from her. I love how Harriet repairs her friendships but doesn’t relent, and I love the quietly subversive ending: in a reversal of all the stories where women writers are pathologised or perceived as irreparably broken, Harriet is taken to a counsellor who says there’s nothing whatsoever wrong with her. She also learns that tact often involves keeping your own counsel, but she gives herself permission to continue to speak freely on the page and in the private realm of her thoughts. I’ve heard good things about the 1996 movie version, starring Michelle “Dawnie” Trachtenberg as Harriet. Have any of you watched it? Did you see that piece in The New Yorker on Harriet and Scout from To Kill a Mockingbird? (http://www.theparisreview.org/blog/2014/03/07/pork-products-in-the-work-of-harper-lee/) I really want to read Harriet the Spy now - I thought it was a much younger child's book, but now realise my error. I have both read this and seen the movie - I saw the movie first and then read the book. I was young at the time, I'd guess 10 because I think we went to go see the movie in the theatre, but I really liked both, so much so that I decided to carry around a notebook and "spy" for a while! I really identified with Harriet. I'm glad the book stands up so well, I suspect it's worth a re-read for me. I really enjoyed this when I read it with my daughter a couple of years ago. I have seen the movie, but so long ago that I barely remember it. I think that instead of watching the movie you should instead read The Long Secret, which I stealthily and unpopularly think is kind of a better book than Harriet the Spy. Or at least it is AS GOOD. When I was a kid, the adults in Louise Fitzhugh books baffled me, and I was sure that when I was an adult myself, they'd all make more sense. They haven't so far, though. The adults in The Long Secret are even stranger. I remember being really disappointed in this book when I read it as a kid. I agree with you that it's completely different from what I was expecting. I remember being really annoyed with Harriet. -- and came to the conclusion that Harriet was probably autistic and that it was handled well for the time but could be handled better now. I wish this story would be updated because I don't think it gives quite the right message without that sort of context. It has advice (like about when to lie) that would be great for kids on the spectrum but not as good for "typical" kids. I loved this one when I was young, but I've never re-read it. I would how differently I would think about it if I read it as an adult for the first time. I do not agree with Jenny that The Long Secret is as good or better. It's okay. This one is the best, though. Much better than the movie. I may be a bit irrational on the subject of this book. It was the only book I owned the summer I turned 11 when we spent 8 weeks in Hawaii, and I reread it over and over. My best friend and I were totally obsessed with this book when we were eight. We spent months scribbling things in tiny notebooks and referencing the story every chance we got. I haven't read it since, then, though. Your review makes me want to revisit it, stat. Regarding THE LONG SECRET: I really enjoyed it when I was a kid, but I remember almost nothing other than that. I have never seen the movie version, but this was one of my absolute favorites in grade school. I adored Harriet, and I remember carrying around a notebook for weeks and weeks after reading. I actually want to re-read it now. aw this is one of those classics I've never read but think I should.